Some marine mammals travel thousands of kilometres to find their food, continuously diving to great depths. By instrumenting them, it is possible to directly observe their foraging behaviour. Simultaneously, we collect unique oceanographic data in the remote Polar regions. The MEOP consortium (MEOP stands for "Marine Mammals Exploring the Oceans Pole to Pole") brings together several national programmes to produce a comprehensive quality-controlled database of oceanographic data obtained in Polar Regions from instrumented marine mammals. This website presents the MEOP project, and the members of the MEOP consortium. 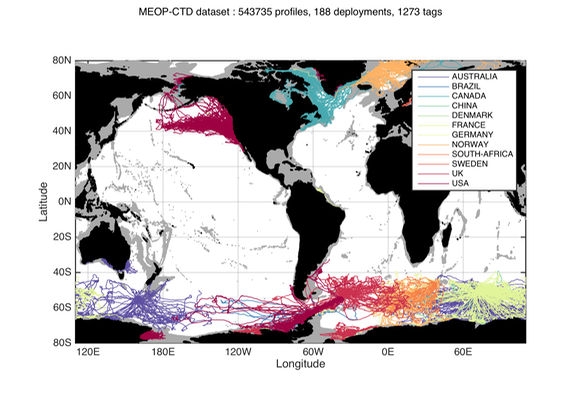 It also makes the quality-controlled MEOP-CTD database publicly available to the scientific and operational oceanography communities. World map showing the distribution of CTD profiles (i.e. vertical profiles of temperature and salinity) currently available in the MEOP-CTD database (November 2017 version). More information on the data distribution can be found on this website.